Seatka, the evil spirit of the ocean, lived along the coast. No good came from him. All the coast tribes feared him, for they knew how dangerous and treacherous he was. The tribes of the far mountains feared him not and when they came to the coast to trade, they brought with them their families, horses and dogs, and the children carried their pets. The great Chief Siskiyou was coming that Chinook moon of long ago, bringing with him his beautiful daughter Ewauna. This being a great honor, a potlatch was planned by the four chiefs of the coast. Necomah, being the strongest of them all, was appointed by the three other chiefs manager of the affair. Because of the determination to show how prosperous the coast nations were, the potlatch of all potlatches was decided upon. The days before the potlatch were busy days for the coast tribes. Necomah ordered great quantities of clams and mussels gathered and placed in huge mounds covered with sea moss and spicy leaves of the myrtle tree ready for the fires. Eight fat bear were ready also for the hot spit. The Elks brought one hundred salmon cleaned and ready for spit of green willow boughs under which glowed driftwood fires, the hot coals of which were best for the roasting. The old squaws tended these. The Sixes brought the meat of a dozen elk; the Rogues twenty cayuses loaded with deer dressed ready for the feast. Under a long arbor of cedar trees the tables were placed – logs split down the middle were used with the flat side up. From cedar bark the squaws made huge trays which were filled with huckleberries and wild honey. Spoons of clam shells, plates of bark and cups hollowed from burnt wood kept the squaws busy, although plenty of time was allowed for the preparations. On the hills back of the camp a lookout was placed to herald the approaching visitors. On the bluff, armed warriors were watching so that Seatka could not cause trouble. With a yell the runners tell of the coming of the Siskiyou a day and a night off. Into the pit go the bear, elk and deer, covered deep with hot bark. The clams are not cooked until the last hour before the feast. First to arrive was Chief Siskiyou with the beautiful daughter. He encamped at some distance from the potlatch grounds. Ewauna had never before seen the ocean. To her it was most beautiful for she thought that at last she had found the place where the beautiful clouds were made that she saw each day from her home in the mountains. She laughed at the warnings of the old men to be careful not to wander alone near the bluff as Seatka might see her and claim her for his own. She brought with her her dog Komax and her cat and kittens which she carried in a basket. Her father had bought the cat from a French trapper who had carried it from Montreal. The cat and kittens were great curiosities to the coast tribes who had never before seen a domestic cat. The wonder of the Tenas Puss Puss was passed from tribe to tribe. In the early morn of the second day came the four chiefs dressed in their magnificent regalia. Necomah with salutations of good will magnanimously presented his gift of wampum inviting the great chief and his people to the greatest of all potlatches given in honor of the magnitude of Chief Siskiyou’s power. This impressed the great chief and he accepted with stoical indifference. The four chiefs were followed by Chief Siskiyou and in single file the men were followed by the women. The wind wafted the odors of the great vians of the feast. It quickened their steps. Soon all were seated. Necomah gave the welcome talk. Plenty bear, plenty elk, plenty fish. I make plenty eat eat. All day they feasted until drunk with food. They slept where they sat. Ewauna slipped away from the sleeping camp. Calling her dog and taking her cat and kittens she started for the beach. She wished to see old Wecoma, the sea, making the white clouds. The full Chinook moon hung low over the sea – lucid, resplendent in all its glory. Ewauna ran and danced with delight, singing her dance song to the moon. So happy was she with the grandeur of this beautiful Wecoma, she danced nearer and nearer to the water, feeling the wonder at the cool touch of it. She dropped her basket, telling Komax to watch. She ran out into Wecoma and swam and swam and swam – wild with glee. On and on and on she swam, paying no heed to the dog’s cry of danger. On and on far from shore she swam. The friendly moon became obscured as by a black hand and the next thing she knew, she was being grasped by a fearsome creature who came out of the water near her. Komax, who had failed to make her hear his danger call, swam out with the basket and, as the monster seized his beloved mistress, he stuck his sharp teeth into his hand. Howling with rage he kicked the dog off, causing him to drop the basket. Grabbing the cat and kittens he threw them far out into the sea. Seatka held the girl tightly, trying to make her look at him, as his treacherous power lay in his eyes. This she refused to do, telling him she never never would, keeping her face toward the friendly moon. At sunrise her father awoke and finding his daughter gone gave the alarm. They all rushed to the sea. Fearfully they gazed out, seeing the dawn break through the white mist, and then they saw the beautiful face of Ewauna lying on the sea smiling up at the white clouds coming from the north. To the west they saw her cat and kittens and near the beach poor Komax baying for his mistress. 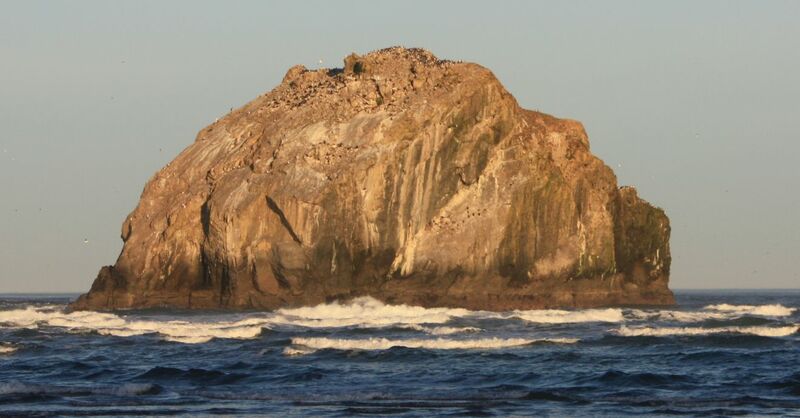 Behind the large rocks near the shore sits Seatka, gazing at Ewauna still trying to catch her eye. But never, never does she falter. Many, many moons she has been there. Now they have all turned to stone. Ottile Parker Kronenberg (1865-1943) was the daughter of Capt. Judah Parker, for whom Parkersburg was named. As a young child she often listened to “Mary,” one of the last of the Nasomah (Coquille) tribe, and delighted in the many Indian stories Mary told her. Mary also taught Mrs. Kronenberg the dialect of Miluk, or Lower Coquille tribe. Although Mary died in 1911, the deep friendship yielded a rich, enduring abundance of Indian tales.